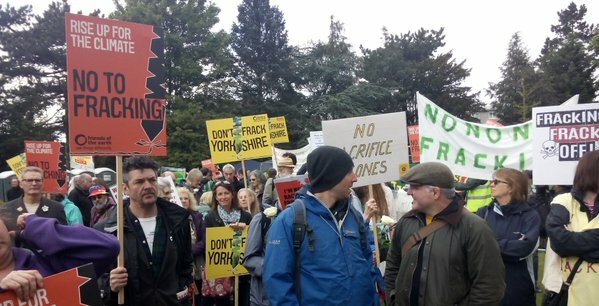 As a result of unsustainable energy consumption and the continous depletion of fossil fuels, the threat of fracking has reared its ugly head across many areas of the UK. Coupled with an ever increasing demand for energy there has been a move towards the exploration of unconventional energy resources such as fracking. Fracking is a method of gas extraction from shale rock which involves pumping water (approx. 4 million gallons for each bore hole), sand and chemicals into the rock at high pressure in order to fracture the rock so it can release gas. Some of the risks it poses are; damage to human health, increased pollution, dangerous working conditions, increased land use, noise pollution, traffic congestion, water contamination, potential for seismic activity (test drilling triggered small tremors in Lancashire, 2011) and an increase in atmospheric pollutants contributing to climate change. Over 170 licences have already been given to different firms across the UK. This licence allows them to undertake oil and gas exploration activities. These licences cover approximately 7,300 square miles of the UK. A recent DEFRA report revealed that house prices would be likely to fall by around 7% if parts of the UK were to be subjected to fracking. The report also admits the risk to human health. It states “There is a risk that even if contaminated surface water does not directly impact drinking water supplies, it can affect human health indirectly through consumption of contaminated wildlife, livestock or agricultural products”. On 23 May, plans to test for shale gas were approved in the village of Kirby Misperton, North Yorkshire despite over 4,000 objections. This is the first time plans of this nature have been approved in the UK in 5 years. So, where does fracking fit in with the UK’s Climate Change Act (2008) which has a 2050 target of reducing greenhouse gas emissions by at least 80% of 1990 levels? Lets move forwards in our battle to fight climate change and put an end towards fossil fuel exploitation.